My father in-law has been living with heart problems for almost 10-years. Medication gradually became less-effective. He has been in the hospital for most of the last two months. Tractor Repairs of course had to take a back seat. He is home again and doing well with a new LVAD heart pump that helps do some of the work his heart has become too weak to do. Sheet Metal work is my least-favorite repair work. I have been spending some time sanding and banging-out the worst of the dents. The grille and hood were bashed-in pretty bad but both came out looking pretty good. 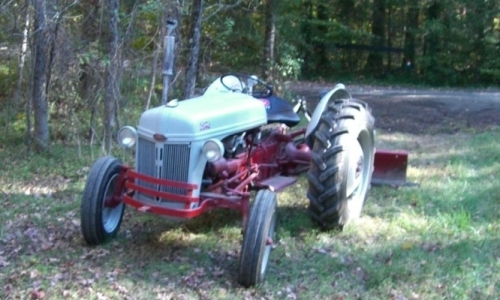 The grille is not correct for this tractor, it does not have the holes for the "Ferguson System" emblem. I could drill it, but found some deals on ebay and ended up with two additional 9N and two 8N grilles. I didn't expect to win all the auctions, but now I can pick the best grille for this build. 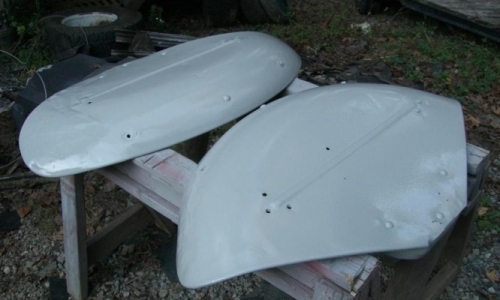 The sheet-metal parts have been sanded down to reveal high and low spots. Those were worked on with hammer and dolly in an attempt to straighten them. 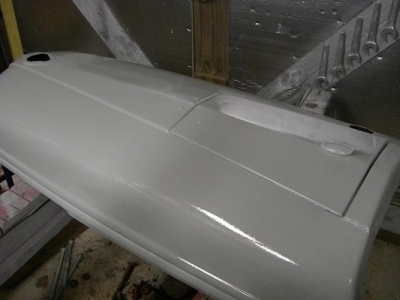 Then the parts were primed and sanded again to reveal how good or bad my efforts were. Some issues have disappeared, but some needed more work. That's about normal for me, GRIN. I started out painting the house. Not the whole thing, just some new siding on one end that needed to be finished before winter. Put a DONE stamp on that and some other chores on Saturday. 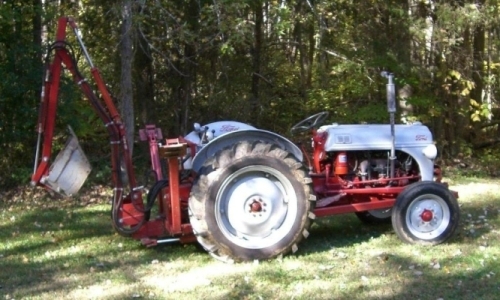 This is the 8N with backhoe attachment. This is the 8N with blade, a little later in the day. Swapping attachments isn't that hard, but I'm looking forward to getting the 2N done. Having two working tractors will mean a lot less swappping of attachments. Pulled all of the large sheet metal parts out and set them up on saw horses for final sanding and painting. Did I mention this is not my favorite type of tractor repair work? Some of my previous repairs on these parts were less than perfect, so I took another whack at them. 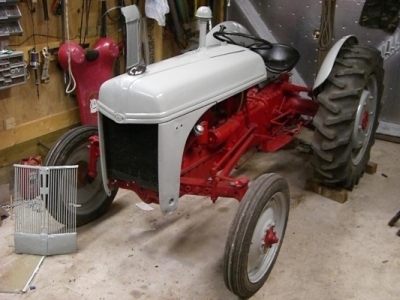 I'm trying a new paint mix for the gray on this tractor. Still using Rust-Oleum® but decided to try mixing their 7786 Smoke Gray with 7770 Almond instead of the white. This mix is slightly darker gray than what I used on the 52. That has held up very well and still looks good after four years. I thought that color was a little too light. I do wear a filter mask even when spray-painting outside. The cheap filters don't stop all solvents or fumes, but they do keep me from breathing overspray. The 2N hood looks OK. The back left corner is where the rust-through was and the nose was pushed-in pretty bad. This is a lot closer to right. As you can see, my sheetmetal work is far from perfect. Ok for me, this is not a show tractor. The dog legs for my hood look bad. Someone cut the bottoms off with a torch and drilled holes to bolt the bottom of the grill in place. These look like 8N parts that were modified to work with a 2N hood/grill. That seems to be a common theme with this tractor. I didn't spend any time working on these dog legs. The plan was to find some 9N parts to replace them. Here we are, ready to assemble the tractor and all I have is these. Oh well, after a quick sanding and primer they looked a little better. These will be on my list to repair or replace later I'm sure. This may be a bit over-the-top. I clear-coated the hood. 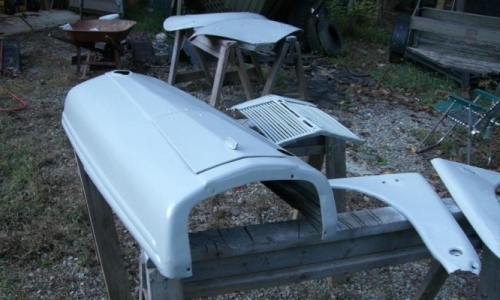 Looks like I'm going to have to clear-coat the other sheet metal parts to match. This is SHINY! I used the Rust-Oleum Clear Enamel as a top coat over the color I mixed. Based on the labeling this appears to be OK. Clear-coating these less-than-perfectly-restored panels may not be the smartest use of time or resources, but it's a good test to see if the products will work. I wouldn't want to be experimenting on perfect sheetmetal. One Lesson-Learned = The base coat needs to be thoroughly dry. Parts like the hood that were painted last week turned out great. A small part I tried that was just dry to the touch failed miserably. The clear coat acts like a solvent and crinkles the uncured base coat. Maybe a cool effect, if that was what I wanted to happen. This part went straight into the electrolysis tank. Tomorrow should be fun, there's a yard full of leaves to deal with, and a small pile of 2N parts like gas tank, air cleaner, lights, brackets, grill, etc. It was warmer Sunday and almost too windy to paint, but the large parts are done and wind isn't as much of an issue with small parts. 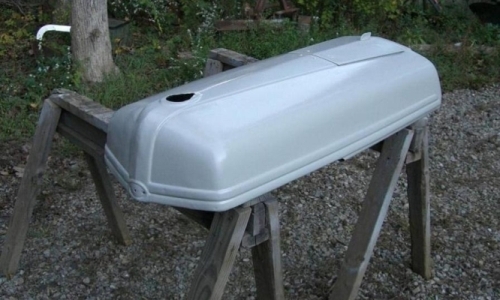 There were a few red parts and the gas tank that I was going to paint with rattle cans. Everything has been prime-painted for a while. Shot at least two coats of paint on everything. The only problem was making sure my overspray was not swirling around in the wind and getting on parts of a different color. 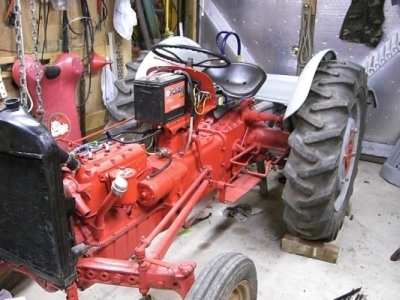 The fuel tank on these tractors was originally unpainted. It had a galvanized/zinc-plated finish. I've never seen an original, but I guess it was similar to the rear rims and lug nuts. I bought some rattle-can Rust-Oleum Hammered Silver finish that looks good on rims, so I painted my gas tank with the same stuff for a "fake plated" look. Went out to the shop after dinner and the new paint on the gas tank was dry enough to assemble that and put the hood on. The front rims and rear centers are painted. I opted to paint the rear hub centers to match the 8N look. I still need to paint the rear hat rims with Rust-Oleum Hammered Silver. That will have to wait until I can drain and de-mount the tires. One rim has a rotten spot. I got a repair piece from a friend on ntractorclub.com. The tire needs to be removed so I can cut out the bad and weld in the good piece.